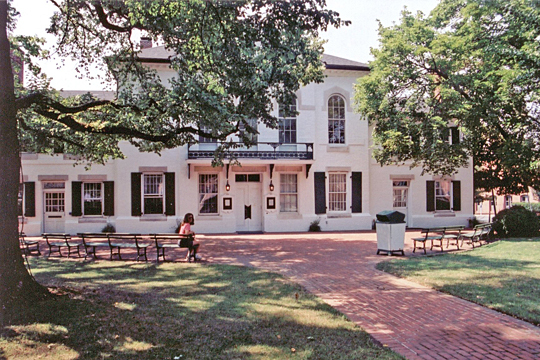 Queen Anne's County Courthouse is located at 107 North Liberty Street, Centreville MD 21617; phone: 410-758-4098. Photo: Queen Anne's County Courthouse, photographed by S. W. Clyde, 2007, en.wikipedia.org, accessed April, 2011. Queen Anne's County was erected in 1706, and the bounds of the four counties of the Great Choptank were described and fixed by the Assembly of that year. Queen Anne's takes in the territory between the Delaware line and the bay, including Kent Island, south of Chester and north of the Wye and Tuckahoe rivers. Queenstown, on the eastern water-front, was the colonial county seat. In provincial times Queen Anne's and Talbot were favorite places of summer residences for leading men of Maryland, who cultivated broad estates in these counties in the intervals between their official duties at Annapolis or participation in its social gaieties.